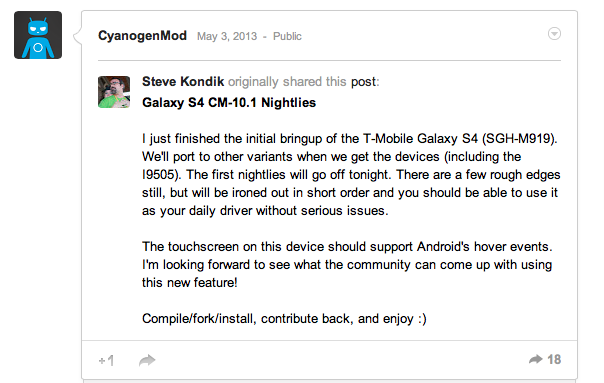 A big heads up to all your Samsung Galaxy S 4 owners out there as CyanogenMod head Steve Kondik noted the very first CM10.1 was now available for the T-Mobile variant of the Samsung Galaxy S 4. Kondik says there are still a “few rough edges” but says they should be ironed out quickly and allow you to use CM10.1 as a daily driver in the very near future. The CM10.1 port includes all the core features and Kondik teased that at some point, the software should include support for Android’s hover events. As with any rooting and software flashing process, make sure you all your info is backed up and you’re familiar with the process! The S4 is a failed device. Not looking forward to this device. Why does someone have to be troll because they state their opinion? Or their opinion doesn’t model yours? It’s called America. Hey idiot! It’s the best device on the market right now. Just cause you can’t come to terms with that’s doesn’t make your statement true. The best device is probably the HTC One or iPhone 5. You probably said that about the S3 a year ago. I was in well need of an upgrade…And have not been disappointed 1 bit its the best phone on the market right now…tomorrow? a new phone will be out? One more reason that makes me want to get the s4! phone is awesome..if i had an S3 I probably wouldve held out..
Had maannnnnyyy Androids. iPhone 5 is the best. Doesn’t lag at all, doesn’t hang up when typing a text. Plus it won’t be slow as hell in 1 year like my droid razr max. You know when the updates come. No waiting. It will still work just the same in 3 years. Have had several galaxies. Should be called the samsuck lagaxy! I will never buy an Apple product as long as I live, but I am very happy about the fact the iPhone 5 is now on T-Mobile. Choice is good for everyone & it will only bring more customers to our beloved Magenta. However, THIS is the only reason I can possibly think of for why I WOULDN’T want the iPhone 5 on our network. Nexus phones are the right way to enjoy Android. What was the last Android phone you owned? I have had Android and presently have an iPhone 4S don’t get me wrong IOS is an Awesome OS but its really stale and has to me almost ran the course of the Old Blackberry OS it always seems leave you wanting more and the only real way for me to enjoy it is to Jailbreak it and even then it seems to have something missing. The last android I owned was a Verizon droid razr max. The last 6 months of stock ice cream sandwich was unbearable. I got slower speeds than I do with an iPhone 5 on TMOBILE . Spending $600 plus for the GS4 and then needing to root and install custom ROM to achieve the proper user experience is insane! How many wanna be nerds will brick their GS4s? I agree with JOEY. The SG4 (16GB) is a failed device. Sammy screwed the pooch with the user available memory problem. Still many will purchase it but enough like me will not purchase or recommend the SG4. Awaiting a better version or the Nexus 4s or 5. ??? There is nothing wrong with the phone the way it is, your comment about us having to root the device to achieve proper use is bull if we wanted to have Stock Android then we would have bought a Nexus device but you see the beauty of Android is that we have the options to get stock Android if we choose to but it’s not a necessity for the phone to work and this whole is with the memory is easily fixed with getting an SD card I purchased a Class 10 32g SD off Newegg for $19.99 and the end cost will still be the same as a 16g iPhone 5. I rooted and ran Cyanogenmod on each and every one of my HTC phones(3) and they ran much faster.. The HTC One would run much faster and so will the GS4, because both HTC and Samsung put bloat on the Android OS. 1st thought, man that was fast. 2nd thought, this is awesome for those that have it whom want more options, 3rd this is good for SGS 3 owners because they’ll get that SGS4 software update that much sooner. Bravo to both Samsung and T-Mobile for not going AT$T’s (GS4) & HTC’s route with the bootloader (locked).